Some people may already know that I have a not-so-secret life as a book artist, as well as a painter. One body of my work as a painter is large portraits of individual burned trees. (See the Burnscape section of my website.) Spending recreational time in the wilderness all over the American West has brought me in close contact with large burned-over areas. I also began to notice the number of dead trees in forests that otherwise seemed fine. I saw what seemed like writing or hieroglyphics on the inner bark of dying trees. It turns out there are thousands of species of bark beetles, most of which are happily decomposing already-dead wood. But a few species that attack living trees en masse have become epidemic thanks to climate change: warmer winters don’t kill off the larvae and warmer, longer summers allow them more reproduction cycles. And drought- or heat-stressed trees are more vulnerable. 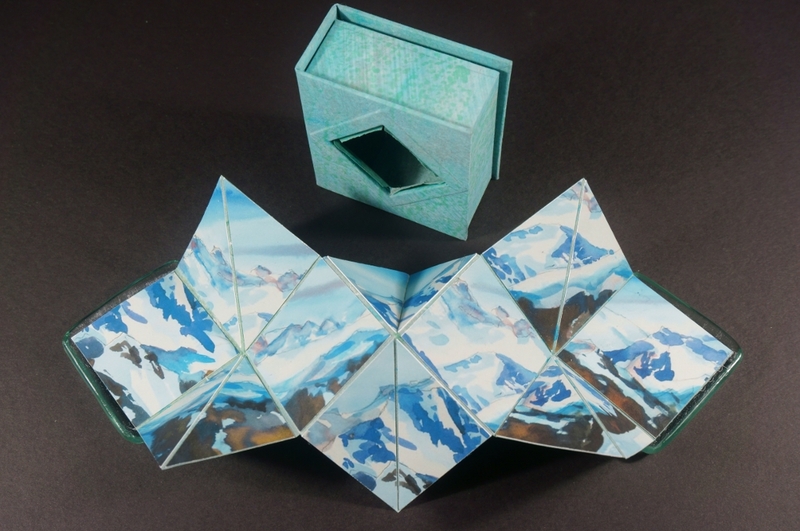 Working with two entomologists and a forester, I’ve created a series of artist books on the topic. For example, Volume XIV, Ars datum est above, is made from an actual Eastern Washington log, with laser-cut pages bound into its center. Each page is essentially a bar from a bar chart representing areas of British Columbia and Alberta affected by mountain pine beetle from 1999-2007 – so the book is art and data, too. My most recent bark beetle book was definitely the most technically ambitious one I’ve tried yet, and I learned quite a bit in the process. I collected a branch with many beetle galleries on it, interesting to me because, with rot, the larval galleries were dark-on-light instead of the more typical light-on-dark. It suggests intra-tree spread: the number of engraved galleries* on the pages increases from bottom to top as you page through the book. The branch was somewhat curved and also twisted along the axis of its split. I thought the best way to create pages for such a irregular, non-rectangular shape might be to obtain a 3D model of each half, create the solid between them and then slice it in software. Unable to find a local service bureau for 3D scanning, a mechanical engineering friend created a seat-of-the-pants XYZ data capture system composed of 2 rulers, a radial arm saw and digital calipers. It took me an entire day to take (4) XYZ measurements at 1-centimeter intervals along one half of the branch. And I now realize this is just too coarse, I missed some key features in the shape. After a lot of work trying to understand how to import an XYZ data cloud Fusion360, we eventually succeeded in making the data points operable, creating the solid volume between to the 2 branch half models, adding binding holes and slicing it. I also traced the actual ragged fore-edge, imported that line and created a second solid to chomp into fore-edge of the book page solid, so that it would have some of the nicks and craters of the beetle galleries where they cross the edges from front edge to back edge. 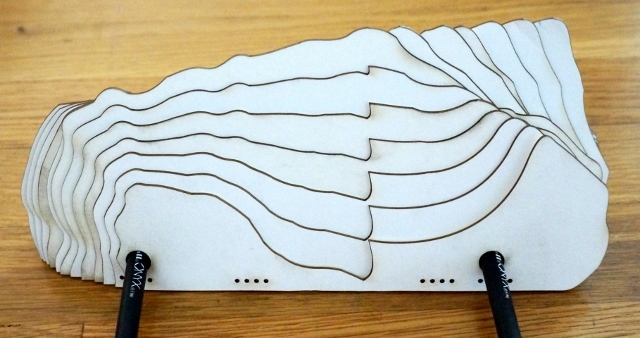 Slicer, a Fusion360 app, at least made the slicing easy and generated flat cutting patterns. Then I traced some of the beetle galleries onto the cutting patterns for engraving. 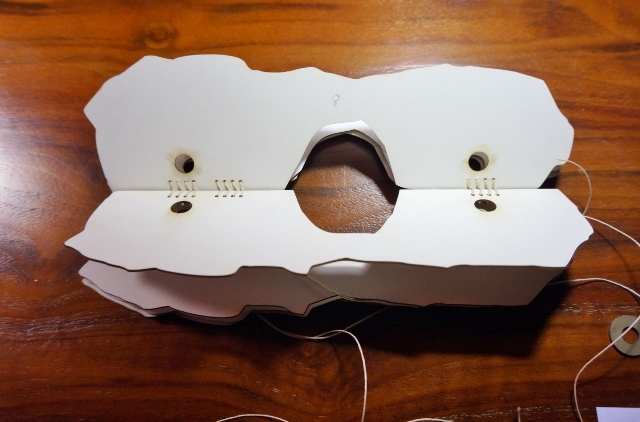 and despite choosing the straightest edge as the binding side, there was enough of a curve that even with elastic thread I couldn’t bind across that big a gap. So it’s “differentially” bound; that is, sewn where spine-side page edges met best. Some of the tiny and/or non-spine side slices were glued to the branch wood before binding. 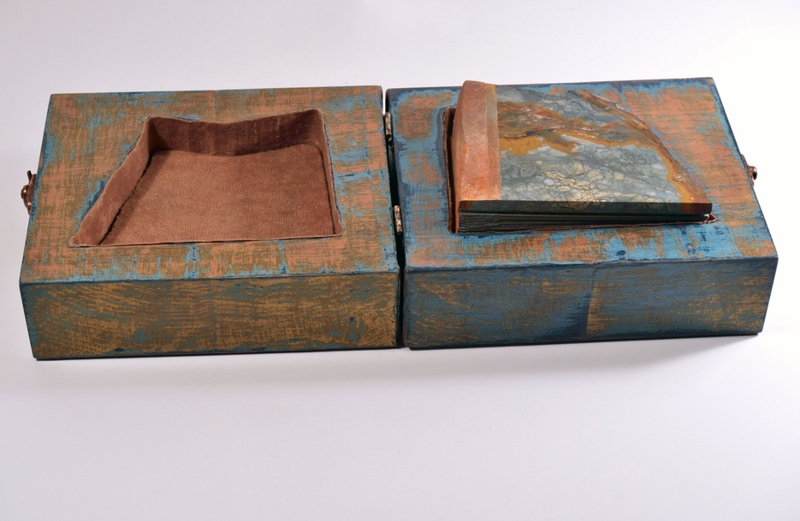 I used pieces of tea-dyed felt as end-papers to soften the stair-stepped edges of the glued-in pieces and to hide the ends of the binding threads. *Galleries is the term most often used to describe the complex patterns that the larvae chew between the bark and the sap wood. I’ve also seen them called larval mines. Once again, the car is packed and ready to drive 1000 miles. In August-September I was among the fortunate recipients of a spot at the Jentel Foundation’s artist residency in north central Wyoming. There is always something that surprises me in every residency I attend – the pleasure of writers reading works-in-progress at Vermont Studio Center; extraordinary modern classical music at The Banff Centre, and so on. Here, I didn’t expect to find pockets of the British Empire among the sage hills of the Big Horn Mountains. In the 19th century a number of English second/third/fourth sons left the mother country and bought cattle ranches. The Big Horn polo club was established in 1898. One local family married back into the Queen’s retinue, so on her 1984 visit, she stopped in Sheridan, community of ~17,000 in north central Wyoming. My other discovery was the banded-gneiss hard-rock core of the Big Horn Mountains. It’s 3 billion years old – two-thirds the age of the planet – and a billion years older than the Vishnu schists at the bottom of the Grand Canyon. The cirques near the divide offer massive faces. Besides rock glacier obstacles to easy hiking (in some cases I made less than a mile an hour), its high elevation (for West-Coaster used to sea-level), this age alone seems worthy of respect. My four fellow visual artists and two writers were good company when I wasn’t off working or walking. The studio spaces are large and cool – important when you’re there in the hot summer months; in our case we also endured many days of thick smoke from Montana and Canada wildfires. I pursued my usual strategy of hiking a day, drawing and painting on location, then “resting” by painting or book-binding all day. 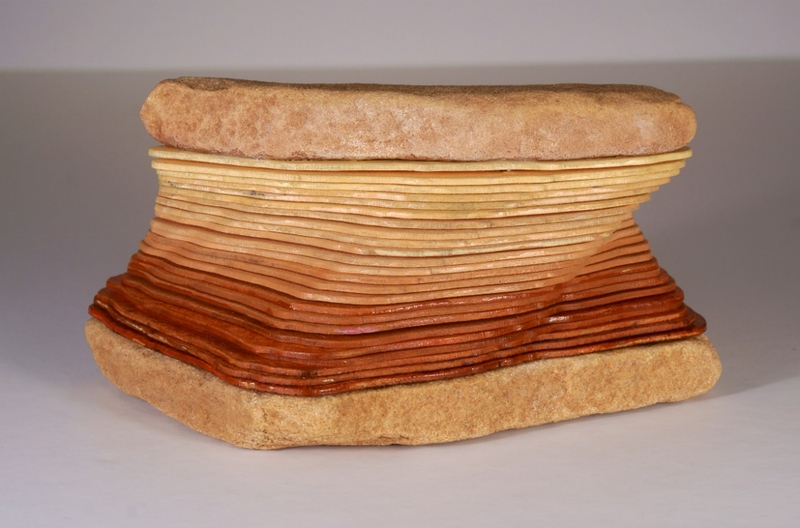 I worked very hard on a beetle book inspired by beautiful slabs of Alaska yellow cedar bored by Buprestid beetles. But after the 80 hours or so it took to finish my interior pages – I just didn’t think they were commensurate with the beauty of the wood. After creating the files to get mat board laser-cut, tracing the beetle galleries I’d seen in the 1988 Lost Fire area of the Big Horns, tea-dying 22 pieces of fragile antique rice paper (with a pattern that looks a bit like wood grain), applying Scotch 568 adhesive, gluing the rice paper to the mat board and dissolving the adhesive in the gallery areas, using a wood-burning tool to outline the galleries… It was very depressing. It took several weeks before I could face scraping off the rice paper and starting over. Bark beetle book Volume XIII, page binding in progress. Maybe Thirteen is jinxed? In the meantime, because I was in Wyoming surrounded by cowboy culture, and because I’d visited Kings Saddlery on our weekly forays into Sheridan, it occurred to me to try making the pages out of debossed leather. As usual in my book projects, this required learning about processes and skills entirely new to me, and multiple tests of methods. All this effort reminds me that the more I follow the many paths my obsessions take me, the closer I think artwork is to science and engineering. I wish all these years I’d been keeping a lab book – preferably searchable – of all the tests of materials and methods I’ve made. It would be easier than pawing through my boxes and boxes of samples with barely readable notes scratched on them. Here are some interim points along my own project path. 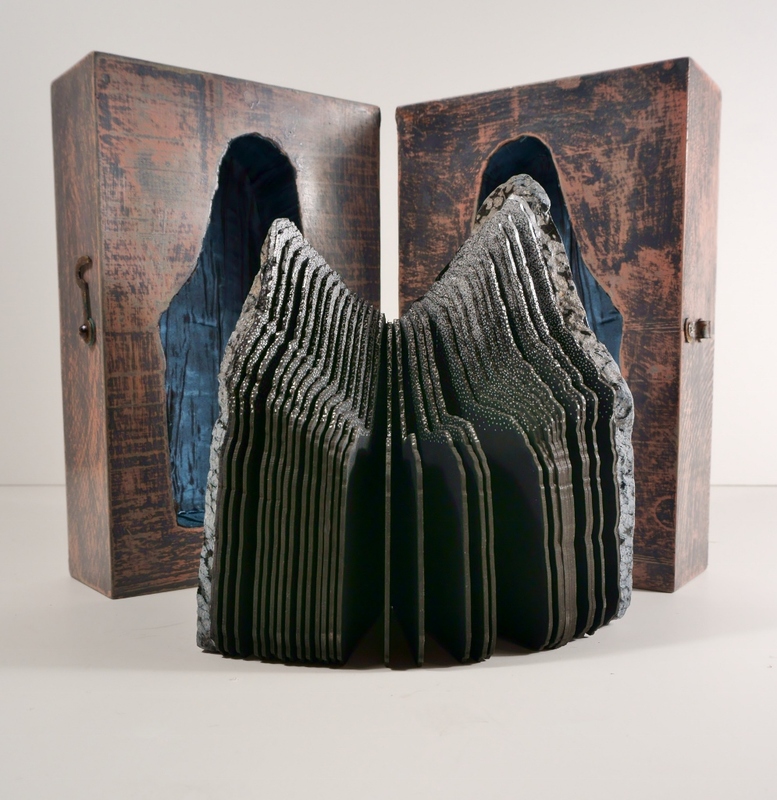 The vision is two artist books, Siamese-twinned at the spines, one small (5″ x 12″) and one large (16″ x 12″). The pages and covers will eventually cut from clear acrylic, though right now I am working with a test run on cardboard. LED lights in the conjoined spine will fluoresce light out to the edges of the acrylic sheets. The object(s) will either sit on a table as separate books or be wall-mounted vertically together. The vision has taken me into some familiar territory: using vector software to interpolate one shape to another over a series of steps so that the “slices” or “pages” describe an overall volume. (I enjoy the multiple meanings of “volume” –dimensional form and particular book.) Those shapes are then laser cut. 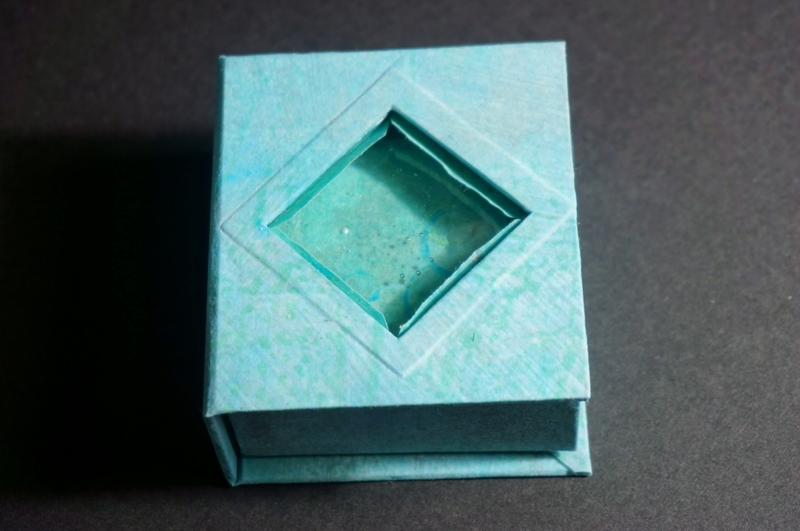 Laser-cut cardboard dummy of the smaller book. 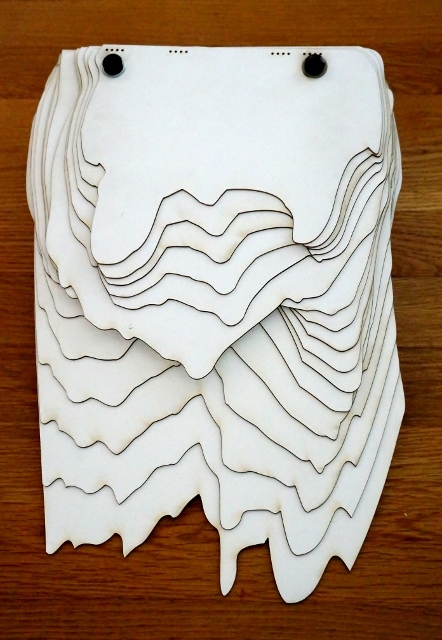 Laser-cut cardboard dummy of the larger book. Here I’m testing my binding method on a cardboard dummy of the small book’s shaped pages. 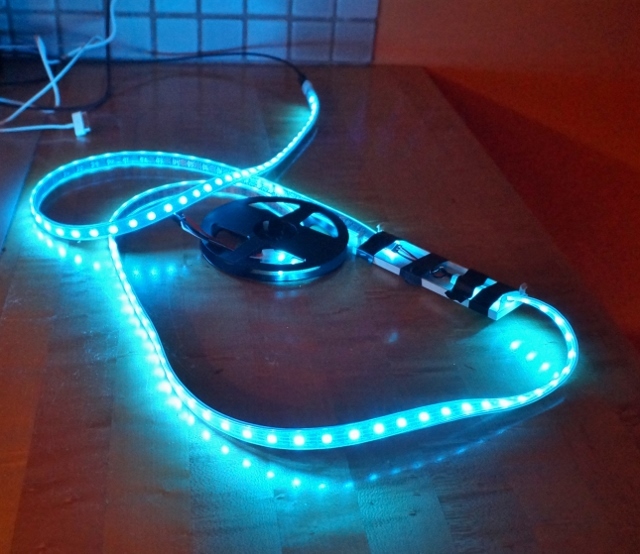 This image shows two strips of LEDs soldered together and running a subtle animation of blue-to-green-to-lighter blue and back again. 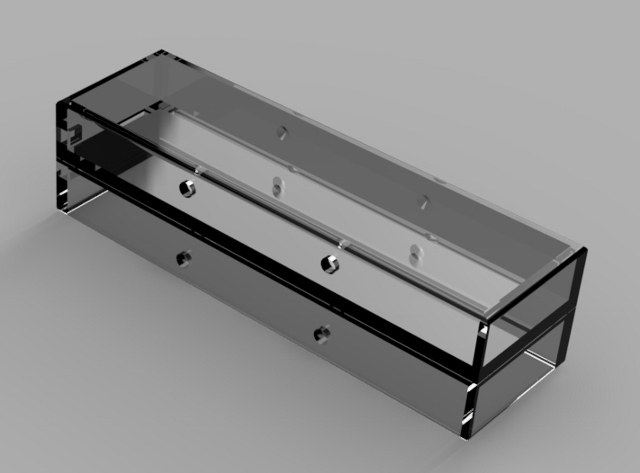 A recent rendering of the custom part for holding the LEDs and butting the pages up them. It feels as if the project will never get finished. So many pieces to fit together, so much time spent learning. One step forward for every two steps back… And what if it isn’t cool?!? Not only does it take tenacity and persistence, but faith that the end result will be worth seeing. Usually I blog when I head out on the road, but I wanted to share a stationary experience. I’m in the midst of an online residency — we have fuze lectures and conference calls, do tutorials, work up files for samples and, hopefully, create a finished project in a four-week period. The theme is digital fabrication: software-driven laser-cutting, 3D printing, CNC milling and routing, textile printing, digital embroidery and so forth, offered by Digital Fabrication Residency of Easton, Maryland. (Of course, being online, location is irrelevant.) Kari and Erik are incredibly knowledgeable and generous with their time and learning. It’s an opportunity for me to unite my dormant inner geek with my artistic practice. While I still think of myself primarily as a painter, artist books have become another important medium. They offer dimension, intimacy, proceed through time, carry a lot of cultural baggage, and can exist somewhere other than on a wall. Rockbound Book: Snowline. Sliced snowflake obsidian covers, stiff leaf bound with viscose fabric to laser-cut mat board pages; CNC-routed wooden case. Rockbound Book: Canyon. Sliced chert stiff-leaf-bound to laser-cut matboard pages with viscose fabric. CNC-routed wooden case. Now I am learning to visualize and execute an additional variety of processes. The books have been evolving. They began with re-use of original paintings through reproductions. Somewhere in the first ten or so, I realized that matching the book’s form and materials to the painted subject matter was at least as exciting as the paintings-as-pages. More recent examples these books not only don’t need text, they don’t even need images. The form and the materials *are* the narrative! Elephant Canyon Volume. Sandstone covers, laser-cut mat board pages, strung on elastic cords. The book “opens” by pulling up the top cover. generating new ideas, seeing new ways to do new things. I’ll be excited to share images of the results when they’re finished. 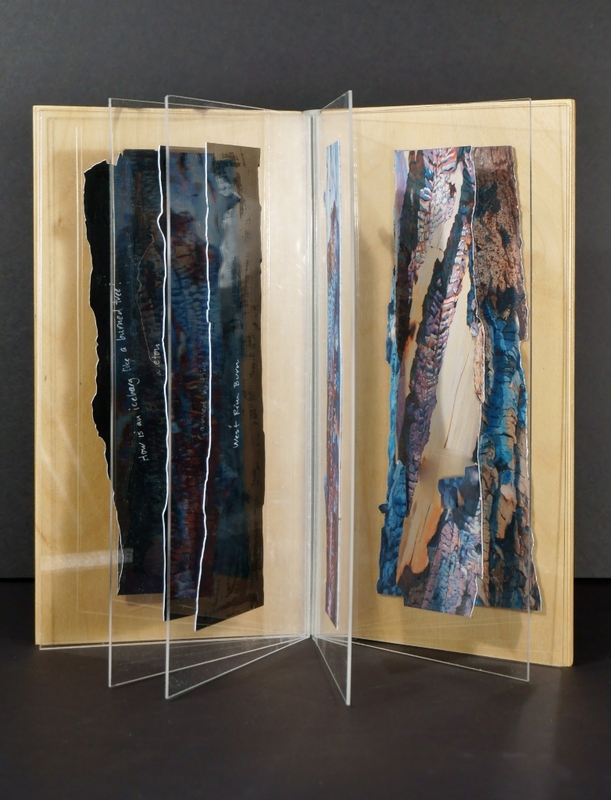 I had hoped to bind acrylic sheet “pages” to wood “covers” using stiff-leaf technique. Traditional archival book cloth and PVA adhesive won’t stick to acrylic sheeting. I tried acrylic solvent cement, matte medium, 3M 77, carpenter’s glue, and in all cases, if it stuck at all , the coating on the inside of the book cloth just pulled away from the fibers. I finally resorted to packing tape and Gorilla® duct tape. The latter is less fibrous and more matte than the usual duct tape. I don’t know what the longevity of those adhesives is. A whetstone makes a great quick-and-dirty de-burr and polishing tool for glass tiles. I was able to use Weld’s all-purpose solvent cement to attach them to heavy board for one cover.